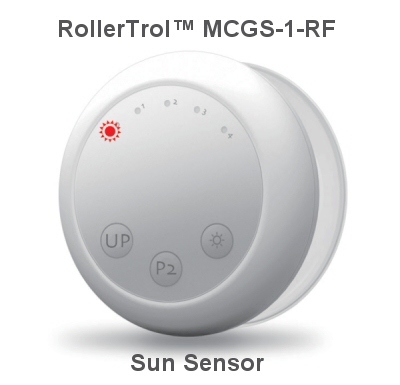 In part 1 we discussed the layout and controls of the MCGS-1-RF wireless window mounted light sensor. It can be used to activate our radio equipped blind and shade motors using a digital RF (Radio Frequency) control signal. In part 2, we will see how to link the light sensor transmitter to the receiver of a radio motor (or a group of several motors). You can think of this unit as a one channel remote control, and you can assign an unlimited number of motors to it, as you can with any remote. At this point the button battery should be inserted into the battery compartment, and the light sensor unit powered up. Please note that the + side of the battery should face up. An LED should light up if you press any button on the control face of the unit. The instructions above refer to our 15 channel remote used with a battery motor, and you may have a different remote and/or motor, but the instructions are esssentially the same. If you prefer, please refer to the instructions that came with your equipment in the shipping email message. Press the P2 button on the SUN SENSOR (see picture above), the motor will beep 7 times and jog. At this point, you are finished - the sun sensor will control the motor, and the travel limits will not be changed. You can push the UP button on the sun sensor to test it. Follow the exact same instructions as above, the only difference is that the motor will beep 5 times and jog to indicate channel was removed from the sun sensor. The process is the same for any other motor you want to assign to the sun sensor.